A progressive jackpot is a very large prize that is available on a progressive slot machine. The prize can range from thousands of dollars to over a million dollars! It is sort of like hitting the lottery; the odds aren't as bad, but you are unlikely to ever win a major progressive jackpot. That being said, there are slots players that hit paylines in the thousands of dollars on progressive slots all the time. To properly explain the progressive jackpot, I'm going to give you a brief overview of the slot machines that we are dealing with. To start, we will usually be talking about one of two different types of slot machines: 3 reel slot machines and 5 reel slot machines. The 3 reel slot machines are just different variations of the old Liberty Bell slots (the one with bells, bars and cherries). There is usually only one payline although some newer games do have up to 9 paylines that you can play. The 3 reel slot machines tend to have smaller progressive jackpots because they are more likely to land the jackpot then the 5 reel machines. The average amount in a 3 reel progressive jackpot will be around $30,000 to $50,000. In order to win the progressive jackpot on a three reel slot machine, you must get the jackpot symbols to line up on the payline. When you are dealing with slots, most of the time there are 64 "stops" on a reel. This is the number of places on the reel where a certain symbol will be shown. There is only 1 jackpot symbol out of 64 on a reel. That means your chances are about 1 in 250,000 of hitting the jackpot. 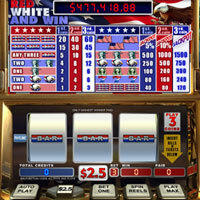 These games are often called video slots because the icons on the reels will animate when you win on a payline. These five reel slot games can tend to confuse beginners at first. There are literally thousands of different video slots with a myriad of different options, bonuses and ways to win. If you take a look under the Bonus Slot Games Reviewed tab, you can see just how different these games can be from each other. You complete paylines from the left side of the screen across the reels to the right side of the screen. There are multiple paylines (between 10 and 30) to bet on. In order to win the progressive jackpot, you will have to bet on all paylines available. Most symbols need three matching in order to win on a payline. Some symbols may only need two or one symbol in a row to win on the payline. Substitutes can always substitute for all other symbols except the scatter. Three scatters or three bonus symbols will usually be the trigger to win bonus rounds and free spins. All 5 reel progressive jackpot slots will have an additional symbol called the progressive jackpot icon. This icon has to line up on a payline across all 5 reels in order to win the progressive jackpot. There are usually awards of a percentage of the progressive jackpot for receiving 3 or 4 progressive jackpot icons as well. The odds of hitting the 5 reel progressive jackpot are closer to the odds of winning when picking lottery numbers. 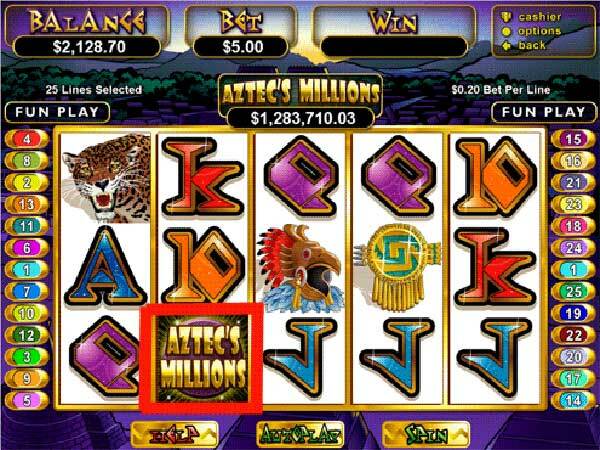 Above is an example of a progressive slot game called Aztec's Millions which has a progressive jackpot worth over $1.2 million! You can clearly see the progressive jackpot symbol highlighted on the reels. In order to win the major jackpot, you need all five symbols to appear on the reels on a payline. The average bet that you will have to make when betting on a progressive slot is usually around $5 per spin. That is where playing with the bonus money will come in handy. Having that bankroll will give you a chance of at least hitting a big payline. I would consider a big payline anything that is more than 50 times your bet. On a $5 spin, that would be a $250 win. You should see a hit like this once every two to five hundred spins. If the progressive slot also offers features like free spins or a bonus round, you must take into consideration that the progressive wins will be less likely than normal. These features act as large wins and can net you a couple hundred dollars when you win them. However, the more features awarded with a slot, the less likely the paylines will payout with wins.